The first Mike’s sub shop was opened in 1956 in the small town of Point Pleasant, New Jersey. Keep in mind, at that time there were very few franchise restaurants. The first shop had to serve the freshest ingredients and offer exceptional customer service to thrive. Mike benefited from opening a shop in Point Pleasant, New Jersey. It was close to one hour south of New York City, one hour east of Philadelphia, and roughly three hours north of Maryland. During the warm summer months, tourists would travel to New Jersey to surf, swim, taste test seafood, and soak in the legendary Jersey Shore experience. Approximately fifteen years after Mike’s sub shop opened its doors for business, a young high school student named Peter Cancro started working behind the counter. He loved his job. Cancro not only enjoyed making authentic subs but also interacting with customers. He took pride in learning a new fact about each customer he came in contact with. When Cancro was a senior in high school, he heard that Mike was planning on selling the shop. Cancro had one goal in mind at 17 years old; purchase the sandwich shop. The only problem was he could not pay out of pocket. He went to his high school football coach and explained that he wanted to own Mike’s sub shop in Point Pleasant, NJ. His coach also happened to be a banker. With his coaches help, Cancro has able to obtain a loan to buy the sub shop. Today, Peter Cancro is the CEO of Jersey Mike’s subs. He manages roughly 1,500 locations across the United States. Despite his title, Cancro has not lost his passion for socializing with customers. He will occasionally hop behind the counter to ask customers about their day. Where Can I Find a Jersey Mike’s Shop? There are more than 1000 locations around the United States. Below is a listing of some of the many facilities around the United States. Does the Company Itself Make Deliveries? Yes, a Jersey Mike’s employee will deliver the food to your home. Is Jersey Mike’s Delivery Available Through Other Third-party Applications? When ordering with Jersey Mike’s mobile app, you can choose to get your meal “as soon as possible” or pick a later time. You may choose a later time by selecting a specific time frame. All future time slots are fifteen minutes. If you select the “as soon as possible” option, you can expect your food to arrive at your door in 15-30 minutes depending on how far away you live from the nearest Jersey Mike’s location. 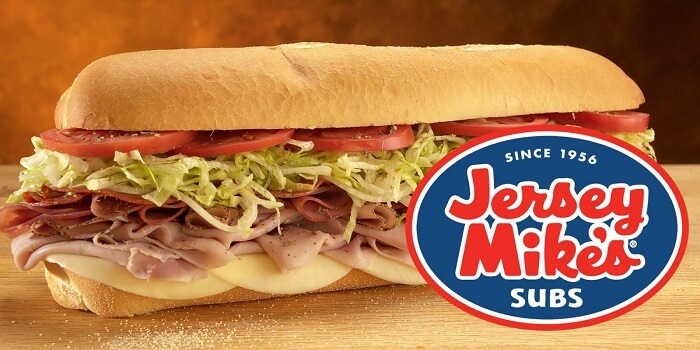 The standard Jersey Mike’s delivery fee for all purchases is $2.50. You are not required to tip the driver, but you may do so if you feel it is necessary. Also included in the delivery total is tax. The amount of tax added to your order will depend on which state you are living in. For example, in North Carolina, there is a ~10.277% tax collected when you order a Jersey Mike’s menu item to your home. Subs By The Box (choose four different subs to be cut up in a box. A 24-hour notice is required for this order.) $74.99. 2 Foot Subs (Choose one cold sub measuring two feet long) $58.99. Mike’s Salad (Spring mix with cherry tomatoes, cucumbers and red cabbage.) $29.99. Regular Lunch Box (Your choice of a regular cold sub, chips, and a cookie.) $11. *Please note that catering orders take an extra 2-3 hours to prepare. The Jersey Mike’s franchise is currently owned and managed by Peter Cancro. There are more than 1000 locations open for business in the United States. Jersey Mike’s will continue to offer excellent customer service and sell sandwiches with premium ingredients. 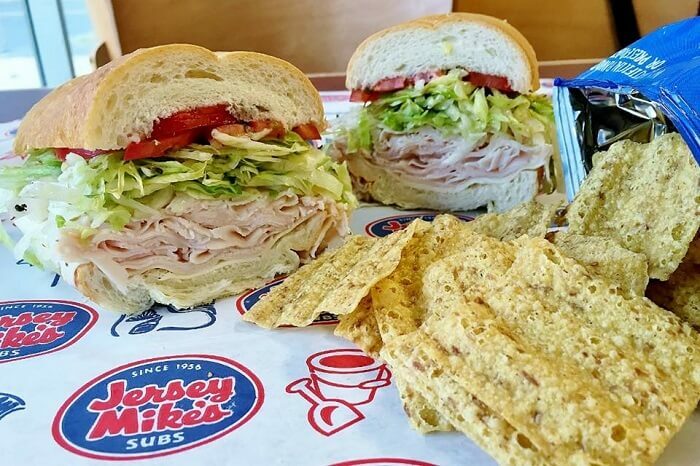 What is your favorite sub to order at Jersey Mike’s? How has your experience with delivery been? Do you use the official Jersey Mike’s app or do you prefer to use one of the other applications that Jersey Mike’s has formed a partnership with? We would love to hear about your experiences in the comments below. Hey Buddy!, I found this information for you: "Jersey Mike’s Delivery 101: Areas, Hours, Fees". Here is the website link: https://all2door.com/jersey-mikes-delivery/. Thank you.